There’s really no getting used to social media when the landscape keeps changing every few months. Right when you think you’ve mastered your social media marketing strategy, you’ll get hit with updates in algorithms and features. This then influences user behavior and buyer habits. So it’s crucial for marketers to be on the lookout for the latest social media statistics that could affect their existing strategies. Many social platforms like Instagram continue to see steady growth in the number of users. Since 2014, the platform has been seeing a year over year increase of no less than 100 million in terms of monthly active users. Between September 2017 and June 2018, the number of monthly active users on Instagram had increased by 200 million. These numbers show how the social media landscape undergoes drastic changes in just a matter of years or months. This means it’s important to constantly stay on top of where your audiences are and how to connect with them. So to make sure you can improve your existing social media marketing efforts, we’ve put together some of the latest social media stats and trends that will help you out. Here are 65 important social media statistics that you’re going to need in 2019. 97% of social advertisers chose it as their most used and most useful social media platform. Facebook no longer holds second place in the latest global website rankings from Alexa and SimilarWeb. YouTube has taken its place, moving Facebook down in third position. Facebook usage among adults in the US has remained more or less the same. 68% of US adults claimed to use Facebook in 2018, which is the exact number of US adult Facebook users reported in 2016. Three-quarters of these current users access the platform on a daily basis. Facebook usage among teens is dropping gradually according to the latest social media statistics. While 71% of teens claimed to use the platform in a 2015, the number has now dropped to 51%. Facebook is the second favorite platform for consuming videos after YouTube. 40% of consumers said that they watch the most videos on Facebook. The platform also appeals to social marketers as an advertising platform with 70% of them choosing Facebook ads as the most useful for achieving their goals. So it’s no surprise that 83% pay for ads on Facebook. The platform has managed to double its revenue per user in three years. Its first quarter earnings for 2018 was $13.2 billion–a 42% increase in revenue year over year. The number of local business pages on Facebook has reached 65 million. Brands see a median engagement rate of 0.09% per Facebook post. Instagram has been experiencing a rapid and steady growth in the number of monthly active users. The platform has also undergone plenty of changes in terms of features and interface. One of the most significant changes was the introduction of IGTV, which enables users to share long-form video content with their followers. The number of monthly active Instagram users has grown to 1 billion according to the latest social media statistics. Instagram continues to attract a younger audience with 72% of teens saying that they use the platform. This is an impressive increase from 2015 when 52% of teens said that they used the platform. Since 2016, there’s also been a 7% increase in the number of US adults who use the platform with 35% of them currently using it. Even in terms of engagement, Instagram is ahead of Facebook with a median engagement rate of 1.60% per post for brands. But among marketers, Instagram still takes second place to Facebook with 83% of them using the platform. 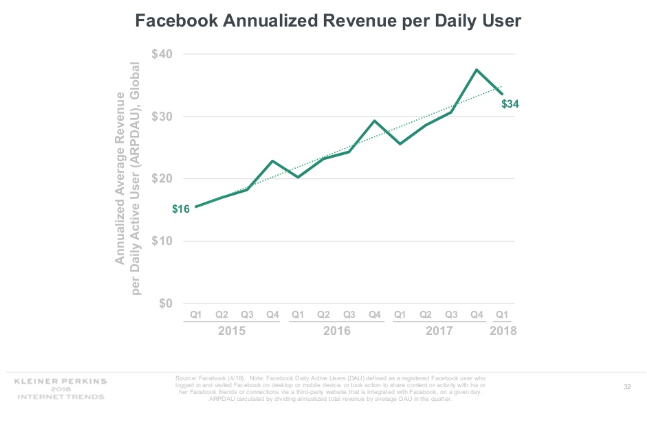 In spite of this, the ad spending on Instagram is 23% higher than on Facebook according to an internal analysis by Merkle. The platform is getting tons of activity with users uploading more than 100 million photos and videos on a daily basis. 2 billion Likes occur on the platform every day. Thursday is the best day to post on Instagram for brands across all verticals. 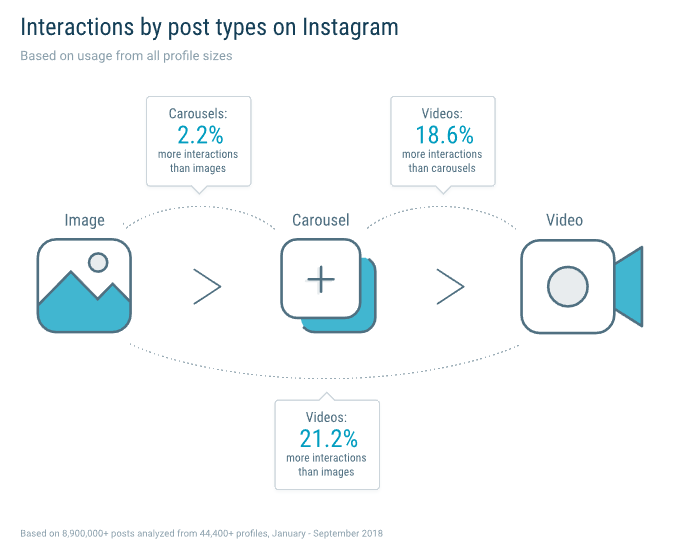 Instagram Profiles saw a follower growth rate of 17-33% during 2018. Videos get 21.2% more interactions compared to images and 18.6% more interactions compared to carousels. As of June 2018, there were 400 million daily active Instagram Stories users. That’s 300 million more users since its launch in 2016. Twitter is still an important social platform for advertisers and immediate customer service. So you should still keep a close eye on the essential social media statistics specific to this platform. 88% of social advertisers use it. This makes it even more popular than Instagram. The platform earned a total of $665 million in revenue during the first quarter of 2018–a 21% increase year over year. $575 million of this total revenue came from ads. That’s another 21% increase. Videos accounted for more than half of this ad revenue. Between May and June of 2018, Twitter suspended more than 70 million fake and suspicious profiles. This may have caused a drop in the total count of users, but also served as a move to increase the authenticity of the content on the platform and build user trust. There are currently 326 million monthly active users on the platform. Twitter users send out 500 million tweets per day. LinkedIn may not see the same rate of growth as platforms like Instagram, since it has a niche audience type that is different from that of other social media platforms. But it continues to be the largest professional network and provides B2B companies with an ideal marketing channel. LinkedIn now has 590 million users with 260 million of them being active on a monthly basis. LinkedIn performs 277% better than Facebook and Twitter when it comes to generating visitor-to-lead conversions. It’s also the platform most used by salespeople to engage with their clients/prospects. 73% of B2B companies said they use it for this purpose. 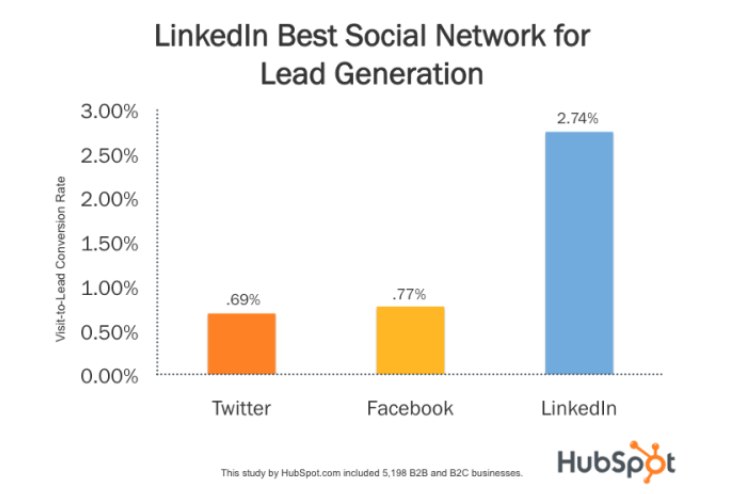 80% of social media B2B leads come from LinkedIn. The three major platforms–Facebook, Twitter and LinkedIn contributed to 90% of social traffic to B2B blogs and sites. And the platform was responsible for half of that traffic. 91% of executives believe that LinkedIn is the top choice for professionally relevant content. 89% of B2B marketers include LinkedIn in their digital marketing mix. 56% of professionals access the platform using multiple devices. 62% of LinkedIn members engage with content on the platform because they found it educational or informative. 61% engage with content because it’s relevant to them. Social media advertising spend in the US is expected to reach $18.4 billion in 2019. Emarketer estimated that the ad spending on social video in the US increased by 38.1% during 2018, reaching $7.85 billion. Facebook controlled 84.9% of this social video ad growth. 57% of millennials feel that ads are becoming more relevant. 45% of Gen Z and 41% of Gen X-ers feel the same, while only 27% of Baby Boomers feel this way. Non-customers are three times more likely than customers to visit retailers from social media ads. 49% said that easy payment systems (like Amazon Pay) would increase their chances of buying through social media. Social media bridges the gap between consumers and brands by providing them with a platform to engage with each other. Brands need to make the most of this and create opportunities for interaction and connection. Otherwise, they could end up losing potential customers. 80% of social marketers said that their key strategy is to increase engagement across social channels. Posts with links to more information are the most preferred type of content on social media. 30% of consumers said that it’s the content they like to see most from brands on social. 18% preferred graphics and images, while 17% would like to see produced video. 61% of social marketers prioritize social media posts that teach. 58% focus on telling a story and 53% focus on posts that inspire. This shows that there’s a huge misalignment with what consumers actually prefer. 73% of consumers want to see posts about discounts and sales. 60% want to see posts that showcase new products and services. 59% want to see posts that teach something. 58% of consumers prefer visual-first content, with their main preferences being graphics and images and produced video. Consumers are equally likely to share and engage with inspirational posts from brands. For 45% of consumers, social media is one of the first channels they go to in case they have any questions or issues. In fact, 21% of consumers would rather message a brand on social media instead of calling up customer service. 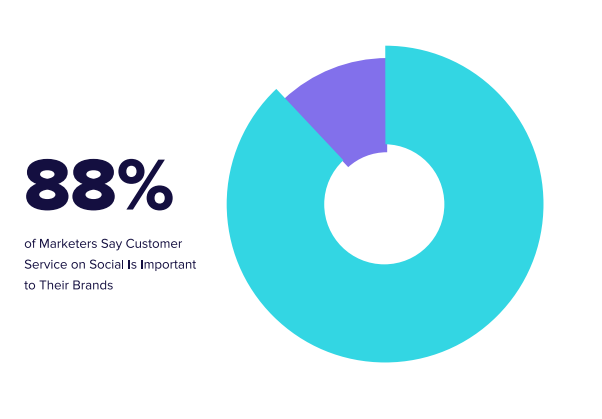 88% of social marketers said that it’s important for their brands to provide customer service through social media. The most common reason why consumers reach out to brands on social media is because they have a question. 57% of consumers reported doing this. The second most common reason is to have an issue with a product or service resolved. 45% of consumers have done this. A fair amount of people (34%) also reach out to brands on social media so they can commend them on their products or services. Brands should use all of these instances as an opportunity to build relationships. 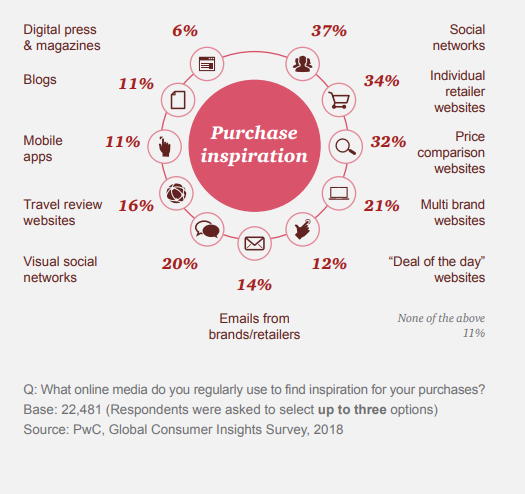 21% of consumers are more likely to buy from brands that they can reach on social media.